We use 3 different methods for cladding/fascia cleaning. One method is using the waterfed pole system. This removes birds droppings and surface dirt. 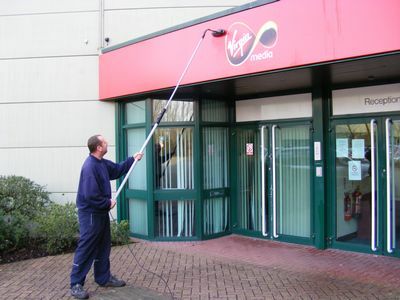 This is a suitable method if the cladding/fascia is cleaned regularly. Another method we use is pressure washing. This is done with our petrol powered pressure washer that remains on the ground whilst operatives work from MEWPs. This is suitable for a more heavily soiled cladding. The most effective method we use is done by hand using MEWPs and a cladding restoration product that cleans, polishes and preserves the cladding/fascia. This is more time consuming but provides excellent results, removing all black rain marks that usually appear over time.